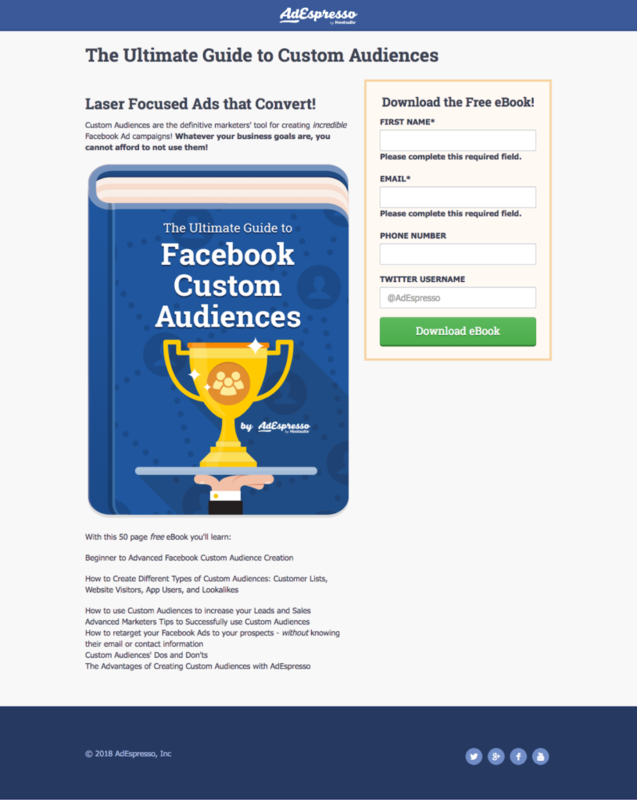 When creating Facebook ads, most of the creative has to fit within certain limitations. For example, the image has to be a set ratio and size, and if the headline, or the link description, are too long, they get cut off. That leaves the ad text as the primary variable, as it can be just a single word or the equivalent of a short story. As the ad text has so many possibilities, we get asked all the time at AdEspresso which length is best? The AdEspresso motto is: Never assume anything. Always test everything. So we invested $1,000 of real ad spend to find the scientific answer. When the book is downloaded it takes the user through to a thank you page where the lead pixel is fired. We tracked the lead pixel and used this to measure our CPA, in this case, cost per lead. Apart from the ad text, we tried to keep everything else as consistent as possible to reduce the effect of any other elements on the ad performance. This means each ad used the same image, headline, link description and CTA button. We tested 7 different ad texts; each one was created by our resident blog writer Ana Gotter to ensure Top quality. 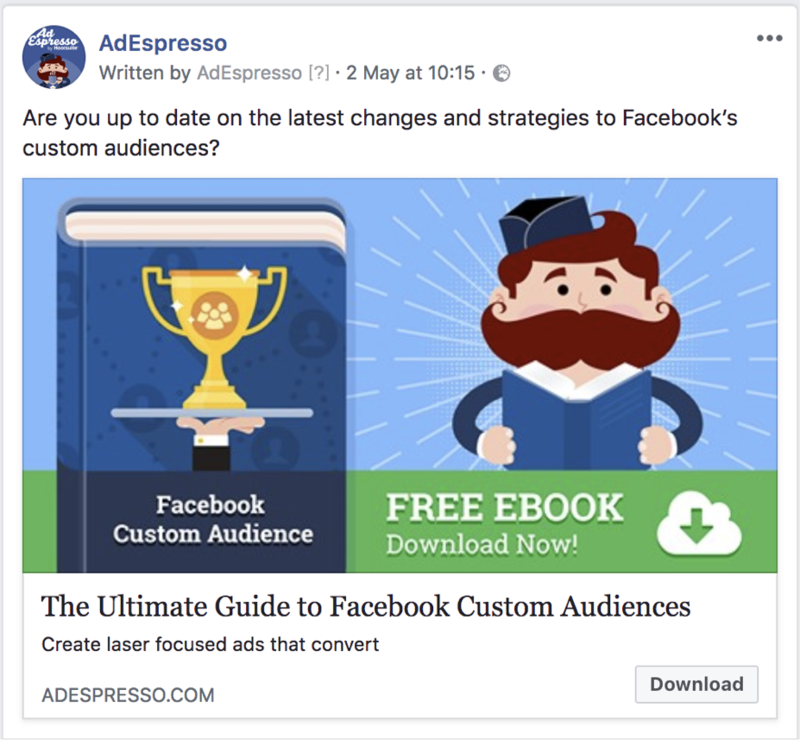 Rather than the AdEspresso team predicting the outcome we polled our customers in our AdEspresso University Facebook group, as well as asking our Hootsuite colleagues. 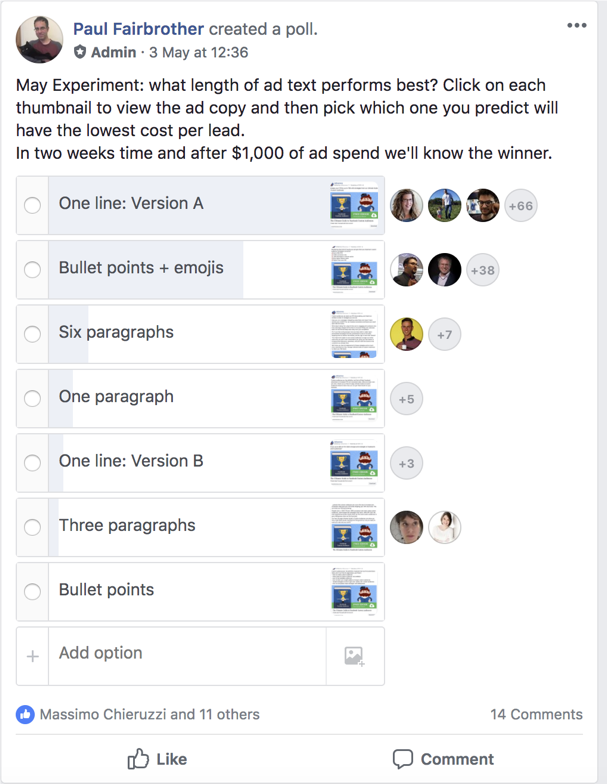 In total, we received 135 votes from this pool of experienced marketers and the prediction was that short ad text would give the lowest cost per lead. The trend that we observed is that the mid to long ad text produced the lowest CPA and the maximum number of leads. When we simplified the ad text by keeping it to just one sentence or by breaking everything out using emojis, the CPA was significantly higher. Only 11% of votes were for the 3 best performing ads. We’ll cover this in more detail in the conclusions section. Note the high cost per click at $5 and relatively high CPM at $46. However, as we covered in another $1000 Experiment: Which Facebook Campaign Optimization Type Works Best? Good quality traffic costs money. In this case, it was worth the price, as it resulted in a 79% conversion rate which is over double what we see for many campaigns. The cost per lead (blue line on the graph) was mostly stable but saw a considerable spike in cost on the 10th May. We were unable to find a reason for this, but it demonstrates the importance of letting a campaign run for long enough to eliminate the effect of day to day random variation. This is a huge variation and could be the difference between ads being profitable and allowing budgets to be scaled and on the other hand having to pause advertising because it’s too expensive. Keep in mind that ad text only has a minor effect on ad performance with the image or video and the headline having the most influence. With a well-designed strategy to A/B test all elements of the ad creative over time, the potential cost savings are enormous. Indeed we’ve seen accounts with a difference of up to 10 times in CPA from the initial campaign to when ads have been tested and refined. After working in advertising or running a business for a while, it’s tempting to think that we know precisely what the audience wants. This experiment proves that we actually get it wrong most of the time. Keep an open mind and always be testing, also be sure to include a few “wildcard” options in your testing as these might surprise you and halve your CPA. Why did the longer versions perform better? It all depends on what your product is. Some value propositions are obvious and can be conveyed in half a dozen words especially for well-known brands or items. 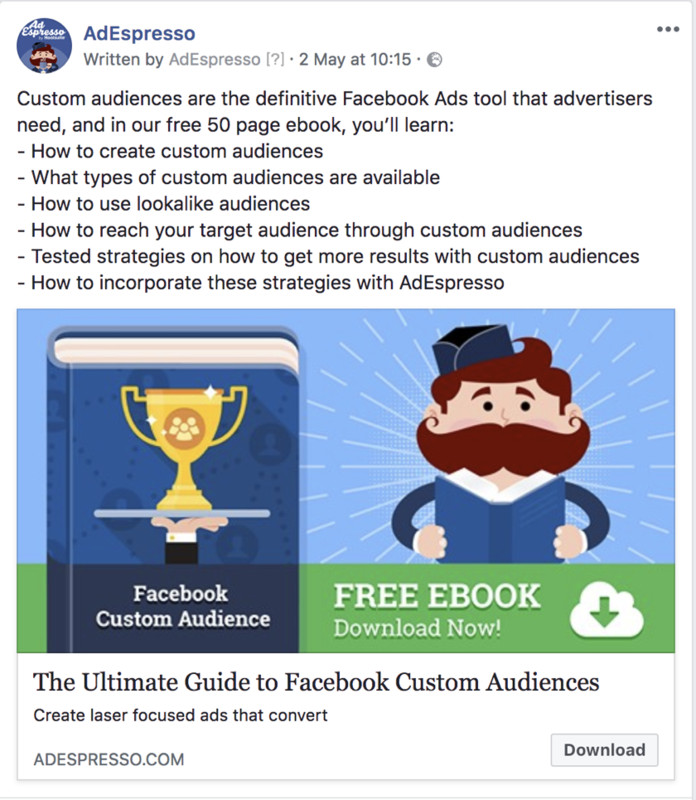 For something more complex, in this case, a guide to Facebook Custom Audiences, the user needs more information before they can assess its value. The audience should also guide your ad creation process. 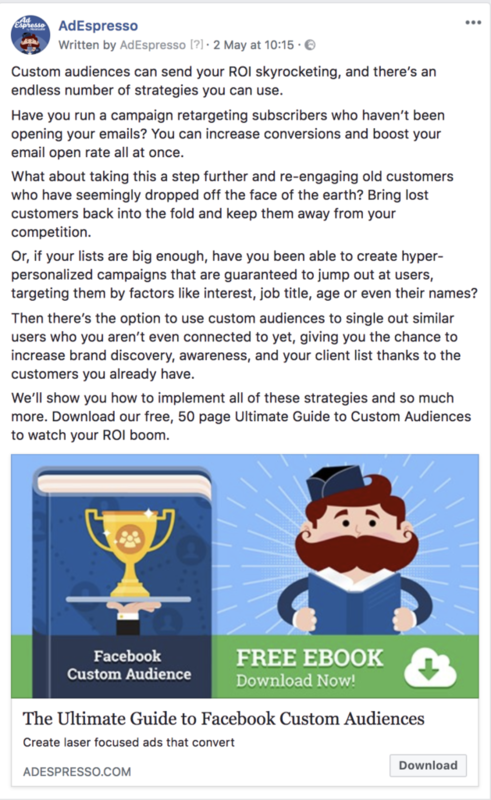 In this case, we were attracting a B2B audience which gets targeted with many different lead magnets, so they want extra information before deciding to take action. Lead magnets aimed at a consumer audience, for example, a free recipe book, may need less explaining and the audience is easier to win over. It’s worth keeping in mind that long-form ad copy only works if it’s written well. In our case, we used a professional copywriter. For many advertisers just starting out, it’s easier to produce short ad text or a series of bullet points, and this may convert better than poorly written longer text. Many businesses might find good results by starting off with short ads and then using the feedback from these to get a specialist to create longer versions. What do you think? Do you prefer to keep it long or cut it short? Will you experiment and share the results of your campaigns? What do you want us to experiment with next time? 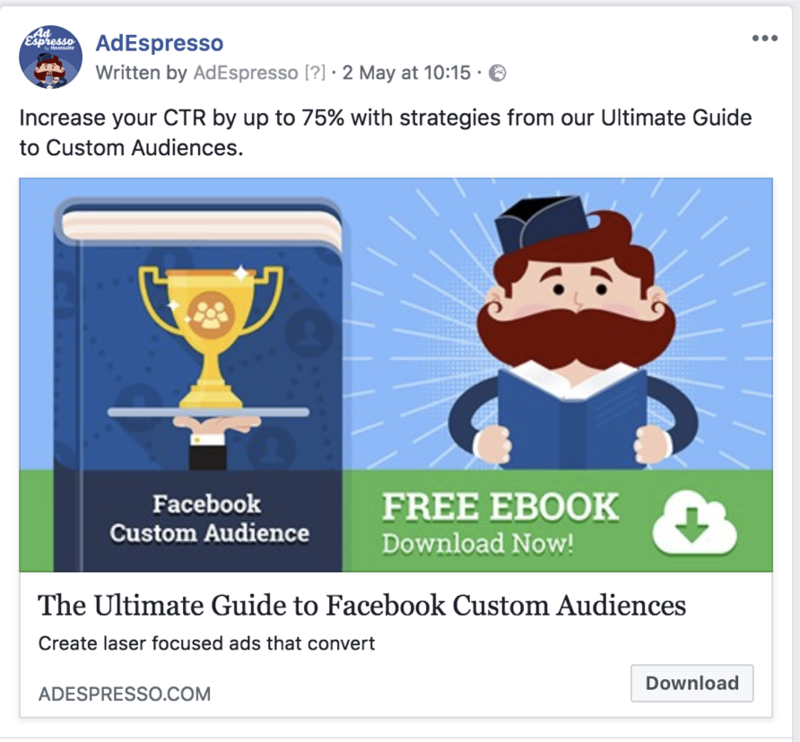 Join our exclusive, AdEspresso University to get access to ALL our $1,000 Experiment, and become a member of our Private AdEspresso University Facebook group only for Top marketers! thank you most attractive article! thanks for the information shared..
A great article indeed. Totally a convention buster. Hi Bertrand, as we mention in the conclusions section the take home message isn’t that a certain text length always work best. 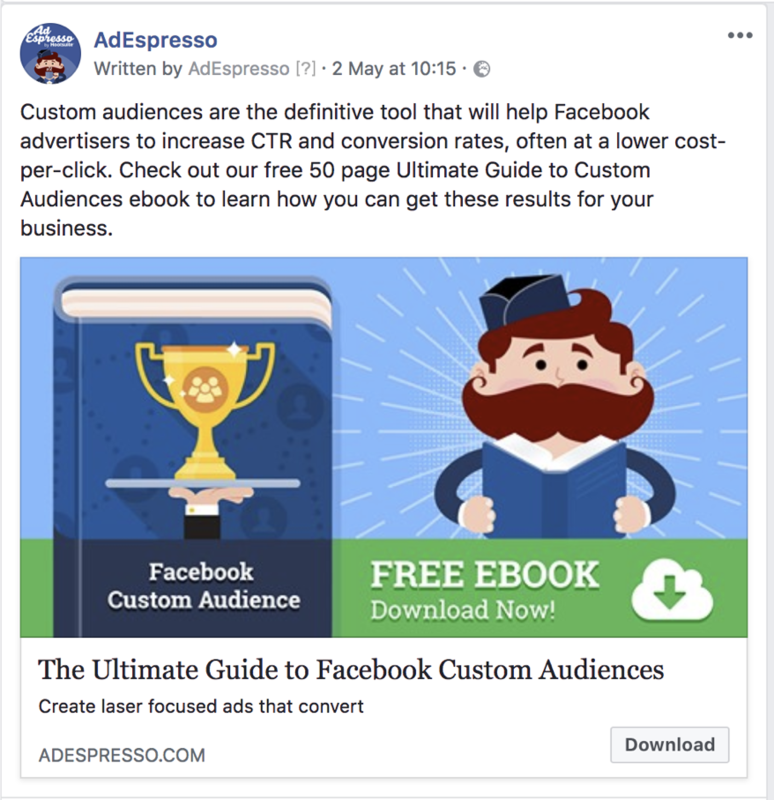 Instead the conclusion is that ad text can make a huge difference to CPA so always test and find out what works best for your business, some products will require longer or shorter ad text. 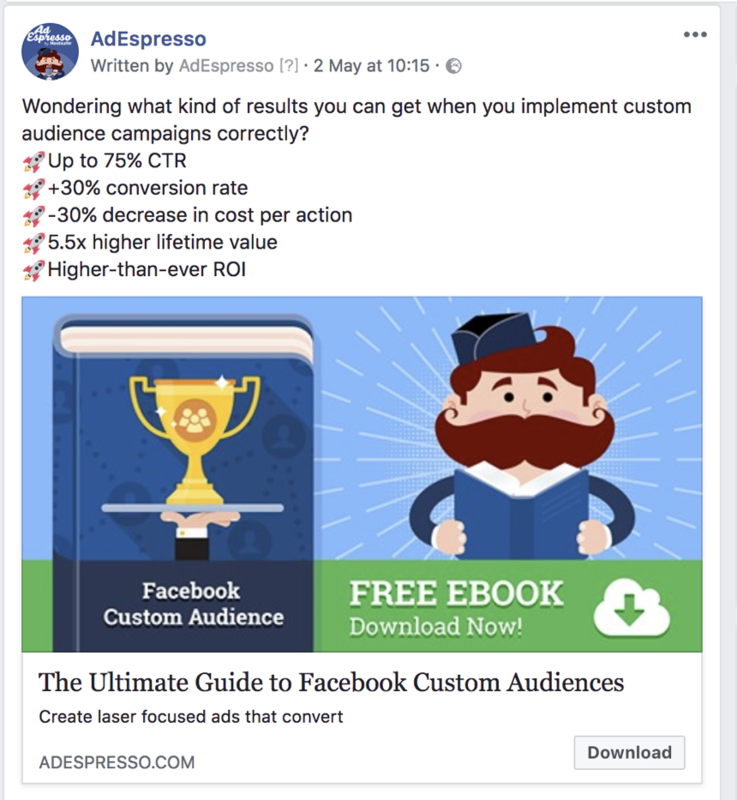 Using AdEspresso would definitely make it easy to rapidly test and analyse the results, if you aren’t already a customer perhaps take out a free trial and see if you can find the perfect ad creative for your business. Thanks for this awesome article. 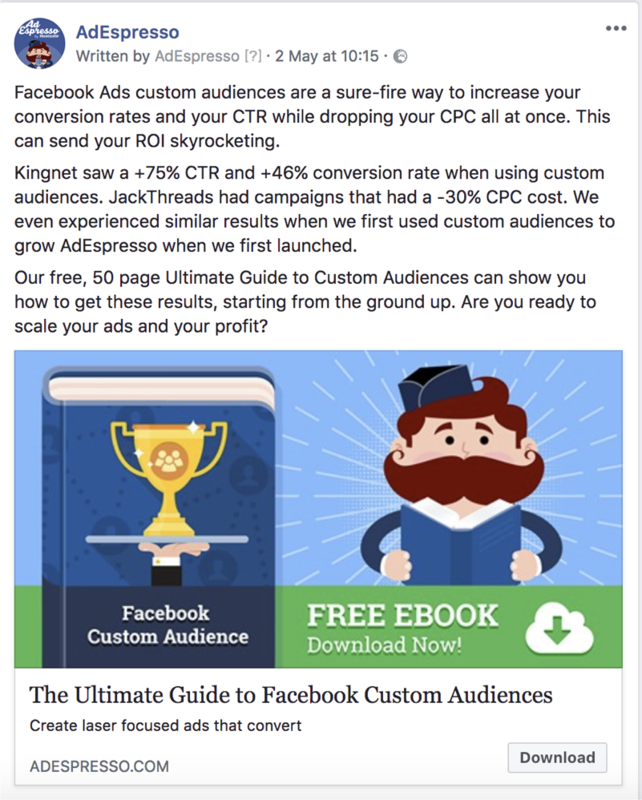 This experiment is really helpful for new users of facebook ads like me. Great insights about ad copy length. When promoting my blog posts and articles to get engagements, I always had confusion whether to write long 2-3 paragraphs or short 3 line ad copy?. after seeing those poll results that you have mentioned in the guide, I think maybe it is good to keep the ad copy length to one paragraph.